As Kevin McCarthy bows out in speaker’s race, how about Mac Thornberry? It’s safe to say that Republicans on Capitol Hill are flummoxed over Rep. McCarthy’s decision to bow out of the race to succeed outgoing Speaker John Boehner. So who’s left among powerful, outspoken but not rabid Republicans who are capable of serving as a bridge between GOP moderates, extremists and the few Democrats left who will even bother to engage with their Republican counterparts? Rep. Mac Thornberry is a ranch-raised boy from Clarendon, a northwestern Texas town that still has the sense to retain its country roots rather than venture toward the citified, sinful ways of nearby Lubbock and Amarillo. Whereas those two cities have a growing number of registered Democrats that night now be straying radically into the double digits – a clear indication of their decay – the Clarendon area remains wholeheartedly Republican, devoted to God, red-meat, fracking and guns. And Thornberry. Thornberry, elected in 1994, is as solid a Republican as they get. His credentials are so solid, he’s now chairman of the powerful House Armed Services Committee – the first Texan to hold the post. I interviewed him for a Point Person feature shortly after he assumed the position. He has not expressed even slight interest in the speaker’s job, and the last time I checked, he was very happy in his current job, which keeps him traveling all over the world. But that hasn’t stopped the speculation. Here’s a link to a National Review column by Kevin D. Williamson, who also wonders whether Thornberry’s name might be worth considering. Williamson notes Thornberry’s very high ratings by both the NRA and American Conservative Union. No one would dare suggest that Thornberry is wishy-washy or limp-wristed. He’s not a flame thrower. He doesn’t engage in blindly harsh partisan rhetoric. He recognizes that there are two sides to the aisle on the House floor, and there’s a Democrat in the White House. He chooses his words carefully, neither backing down from what he believes in nor being so acerbic that he offends the people he’s trying to persuade. You won’t catch Thornberry blurting out career-killing remarks like the comments that got McCarthy in trouble when he bragged at the political damage the Benghazi hearings had inflicted on Democratic presidential candidate Hillary Clinton. If anything, Thornberry is too cautious. And that’s not a bad thing. 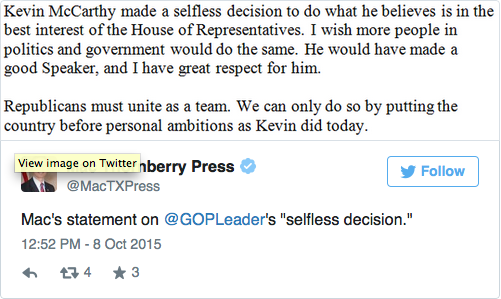 Thornberry’s businesslike approach is exactly what is needed in the House Republican leadership. Plus, he’s relatively young at age 57. He has the energy and stamina to sustain the speaker’s rigorous schedule. I’m no Republican, but I respect decent people. Mac Thornberry is one of the few who have worked their way into positions of power in Washington without letting it penetrate and whittle away at the core of decency that still guides their leadership.